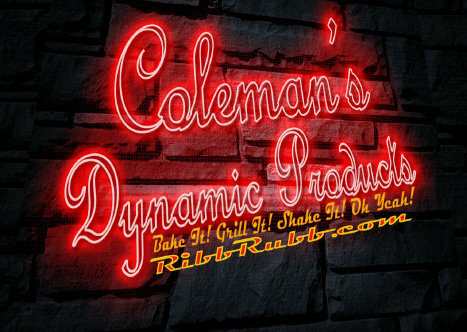 Coleman's Dynamic Products • BLACK American MADE - BAM! Coleman’s Dynamic Products is a subsidiary of ChanBear and Associates, LLC established in May 2008. Our mission at Coleman’s Dynamic Products is to provide high quality, simple marinades for the weekend griller as well as the professional chef. All products were designed and tested personally by me, founder and President David W. Coleman. We are an exciting new company featuring a great line of dry marinades for baking, grilling and snacks. Originally designed for grilling and baking, these dry marinades are now considered all purpose seasonings. Made with 14 different all natural dry seasonings and no preservatives, currently there are 3 flavors each with their own personality. Our slogan is personified in Coleman’s Dynamic RibbNutz. What are RibbNutz? Well, I am glad you asked. 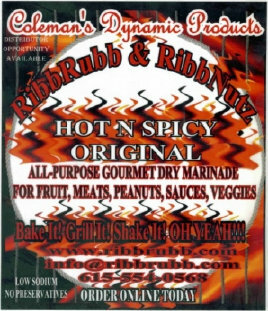 Coleman’s Dynamic RibbNutz is peanuts sautéed then baked with Coleman’s Dynamic RibbRubb. They are delectable delights that tempt your taste buds. They too come in 3 great flavors, Original, Hot’N Spicy and Scorch’N. Lastly, but certainly not least is Coleman’s Dynamic Fry Batter for fish and poultry. Forget about the bland combination of flour and corn meal. Kick it up a notch with the fry batter with an attitude. Coleman’s Dynamic Products can currently be purchased in stores in the Middle Tennessee, west Tennessee and as far away as Los Angeles, CA. Every day we are looking for new markets. Our goal is to double our vendors this summer and continue to grow until Coleman’s Dynamic Products are in every region and in every kitchen cabinet. Within 3 years, we hope to take the southern region by storm with the rest of the nation to follow. Thank you for your support and please continue to watch us grow.